What can you see through binoculars? With standard 10×50 binoculars and reasonable UK country skies (that is, away from city lights but not necessarily free from all light pollution) you should see the following types of object. Stars down to about magnitude 9 or 10, which also includes the planet Neptune and the brighter minor planets such as Ceres and Vesta, which all appear starlike. Binoculars are also good for observing a range of variable stars. From towns and cities, binoculars enable you to see the stars in the fainter constellations, such as Cancer and Aquarius, which might not otherwise be visible. The bright planets are of course visible, though with no details visible other than the disc of Jupiter and its four Galilean satellites. Saturn appears elongated, but in honesty you can’t really see that it has rings as the gap between the rings and the planet is not visible. The phase of Venus is clearly visible when it is at half phase or a crescent. Binoculars are also great for locating Mercury and Venus, and indeed the thin crescent Moon, in a twilight sky after the Sun has set, and once you have found them with binoculars you will find it much easier to spot them with the naked eye. The larger and brighter comets are visible. Each year there may be one or two which can be seen with binoculars, usually newly discovered ones, but don’t expect too much. A faint elongation of the fuzzy blob is often all you see of a tail, though comets are strongly affected by any light pollution and in a better sky you may see a lot more. A good number of the larger star clusters, including most if not all of the 27 in the Messier Catalogue. 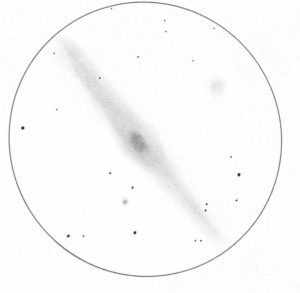 The smaller ones, such as M103, are not very obvious, but there are a number of other clusters in the NGC which are visible. Globular clusters show as circular fuzzy blobs. Many of those in the Messier catalogue are visible, but you won’t see individual stars in them. The Milky Way is transformed into countless stars, as long as your skies are good enough to be able to see it with the naked eye. The brighter nebulae, such as the Orion Nebula, the Lagoon Nebula and the Omega Nebula, though these are more susceptible to light pollution than star clusters. The distinctive shape of each one is obvious in 10 x 50s. The North America Nebula is visible in good skies, though it is not very obvious. One or two dark nebulae are visible, such as ‘Barnard’s E’, but not the Horsehead Nebula. A number of galaxies, including the Andromeda Galaxy (M31), the Whirlpool Galaxy M51, M81 and M82. Some galaxies in the Virgo Cluster are visible, including M87 and M49, as small fuzzy blobs. But binoculars are virtually useless for observing the aurora (Northern Lights), which covers a much larger area of sky than the field of view, and for meteors, which are gone as soon as you see them. Satellites are just a moving point of light which is difficult to track on account of the speed of their movement through the sky, and the International Space Station similarly appears as a point of light through 10×50s. You might see faint meteors and satellites passing through your field of view as you look at other objects, though.